Simply called NIGHT, this contemporary small seconds watch is designed to be the perfect companion to a tuxedo at a gala dinner. The watch comes in five different variations with black or night blue dials, solid gold hour markers and matching alligator leather straps. 16½ lines manually wound engraved UNITAS caliber. - Stainless steel case with night blue matt dial, varnished night blue hours and minutes hands and steel small seconds hand and dial. - Stainless steel case with night blue matt dial, varnished night blue hours and minutes hands and night blue small seconds hand and dial. 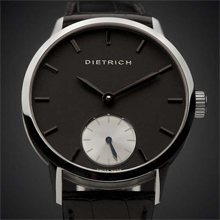 - Stainless steel case with black matt dial, varnished black hours and minutes hands and steel small seconds hand and dial. 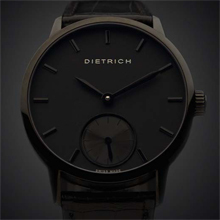 - Stainless steel case with black matt dial, varnished black hours and minutes hands and black small seconds hand and dial. 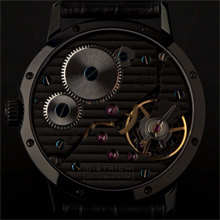 - Black PVD stainless steel case with black matt dial, varnished black hours and minutes hands and black small seconds hand and dial.